West End Productions announces auditions for Dylan Thomas’s masterpiece Under Milk Wood. Auditions will be held at VSA North 4th Art Center located at 4904 4th St. NW which is just north of 4th and Griegos, on the east side of 4th St. General auditions are Saturday, April 6, from 10 AM to 2 PM. No appointment is necessary; auditions will be called in order of arrival. Please bring a head shot and resume. The audition will consist of cold readings from the script. Callbacks, also at VSA North 4th, will be held on Monday, April 8th, at 6 PM. We are looking to cast four men and four women of all ages to comprise an ensemble of eight actors. Since there are nearly seventy characters in the play, each actor will play multiple roles, and will also have large amounts of narration. Rehearsals will begin on Tuesday, September 3. The show opens at VSA North 4th on Friday, October 18, closes Sunday, November 10, and runs Friday and Saturday nights with a matinee on Sunday afternoons. 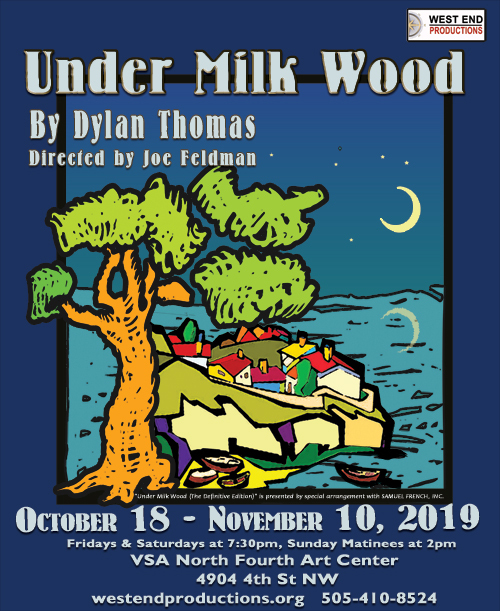 Please note that West End’s production of Under Milk Wood will be physically demanding, and will require movement and vocal work. Also, all actors cast in the production will need to master a Welsh accent. Prior to, and during rehearsals, dialect coaching will be made available to those actors who need it. For further information, please contact director Joe Feldman at joe.s.feldman@gmail.com, or 505-897-3915.